The Asia-Pacific Economic Cooperation (APEC) forum consists of 21 member economies, accounting for 39 percent of global population, 57 percent of global gross domestic product, and 49 percent of global trade. It is the only regional forum gathering the world’s largest economies. APEC is also the largest economic forum in the Asia-Pacific region, with the participation of economies from America, Asia, Europe, and Oceania. Comprising 50 working groups, APEC highly appreciates the role of businesses. Deputy Prime Minister Pham Binh Minh, Chairman of the National Committee for APEC 2017, said that over the past 27 years, APEC has shown its strong vitality, especially at difficult times. At the pinnacle of the 1997-1998 regional financial crisis and the 2008-2009 global economic recession, APEC member economies maintained tight cooperation to overcome difficulties. APEC has adapted itself to the new situation. “However, the formation of new regional mechanisms requires APEC to renovate itself to affirm its role as a leading economic forum. Its cooperation and connection activities need to be expanded to bring more practical results,” he added. 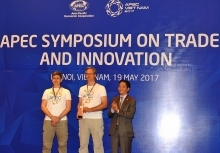 As the host of APEC 2017, Vietnam has recommended the theme “Creating a new driving force for a common future” for all APEC meetings. APEC members have reached a consensus on the theme, agreeing to tighten cooperation to promote sustainable, creative and inclusive growth, expand and deepen regional economic linkages, enhance the competitiveness and creativity of very small, small, and medium businesses in the digital era, strengthen food security and agricultural sustainability, and adaptability to climate change. The theme reflects APEC’s long-term goal of maintaining peace, stability, growth, connectivity, and prosperity in the Asia-Pacific region. Vietnam considers APEC 2017 the focus of its external relations in 2017. (1) substantially contribute to APEC’s progress, making regional cooperation more practical and effective; achieve the 2020 Bogor goals of investment and trade liberalization. (2) enhance APEC’s position as a leading economic cooperation forum and a pioneer in promoting regional connectivity, peace, stability, cooperation, and development. (3) strengthen the friendship and partnership with other APEC members. 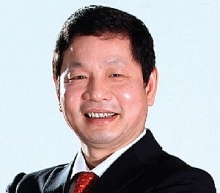 Vietnamese businesses expect opportunities to establish relations with world leading partners. (4) promote the image of Vietnam as a country of great potential and dynamism in renovation and international integration; bring development opportunities for localities, businesses, and people. Deputy Prime Minister Pham Binh Minh affirmed that after three decades of renovation, Vietnam, with its improved global position, is confident of its ability to make more practical contributions to APEC, bringing substantial benefits to businesses and people in the region. 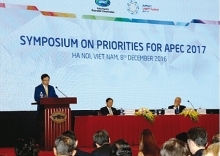 Increased economic cooperation and free trade agreements between Vietnam and most APEC members provided testimony to Vietnam’s commitments with APEC as well as the Asia-Pacific region. Vietnamese President Tran Dai Quang put emphasis on the role of Vietnam as the host of APEC 2017 and appealed to the entire political system, sectors, the business community, and people nationwide to actively participate in preparations for APEC Year 2017. He expected that through APEC 2017, international friends would have deep feelings about Vietnam as a country of peace, stability, and dynamic development, as well as friendly Vietnamese people. APEC 2017 will comprise nearly 200 activities to take place throughout the year. The most important activity will be a week-long summit gathering the leaders of 21 member economies, which will take place in the city of Da Nang in November. There will be eight ministerial-level meetings and a lot of activities at a working-group level to take place in Hanoi, Nha Trang, Vinh, Ninh Binh, Ha Long, Hue, Can Tho, Ho Chi Minh City, Hoi An, and Da Nang. Vietnam expects to welcome tens of thousands of international participants in APEC 2017 activities, including about 1,000 leaders of reputable groups and thousands of reporters from news agencies and media organizations in the region and worldwide. APEC 2017 will offer good opportunities for Vietnamese localities to introduce their cultures and products to regional and international friends, as well as for the domestic business community to seek new partners. To make the most of these opportunities, Vietnamese localities have taken the initiative in preparing for a successful APEC 2017. Apart from preparations in terms of material facilities, human resources are trained to take part in organizational, reception, and logistics activities. Preparations are underway to produce publications providing information about APEC Year 2017 as well as introducing the potential and advantages of Vietnamese localities. Asia-Pacific community through trade and investment liberalization and regional economic linkages.